\r\nIn 2007, Jason Liebman co-founded Howcast with the goal of creating the largest – and highest-quality – library of how-to videos on the web, providing users with the answer to almost any question, from How to Tie a Bow Tie to How to Survive a Bear Attack. Jason is also a co-founder of the Alliance of Youth Movements (AYM), a non-profit organization that helps young people to effect nonviolent change around the world using 21st-century tools. \r\nPrior to Howcast, Jason worked at Google, for the YouTube, Google Video and AdSense teams. Before Google, Jason was executive vice president of sales and business development at Applied Semantics before it was acquired by Google in 2003 – one of Google's largest acquisitions in its history. 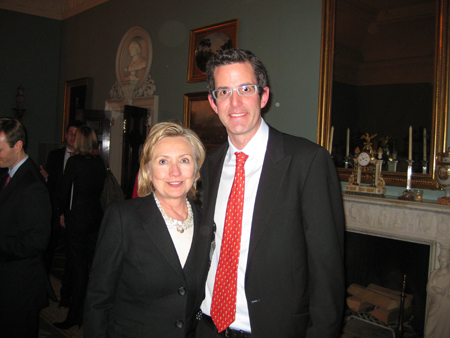 Last night I was honored to attend a small dinner with Secretary Hillary Clinton hosted at the U.S. State Department, which included a great list of notable guests, including Google CEO Eric Schmidt, Twitter Founder Jack Dorsey, Mobile Accord CEO James Eberhard, Microsoft CSO Craig Mundie, Cisco CMO Susan Bostron, NYU Professor Clay Shirky, and Personal Democracy founder Andrew Rasiej, to name a few. Secretary Clinton has a great deal of interest in technology and how it can drive engagement around the world. Kicking off 2010 with a two-hour discussion with technology leaders about 21st-century statecraft shows that she is serious about this. She realizes that if U.S. diplomatic policy is going to encourage civil society development, and fight violence and oppression, 21st-century tools like Twitter, Google, and YouTube are going to be key. It's all part of her 21st-century statecraft strategy: harnessing the power of technology tools to promote diplomacy around the globe. Yesterday, Senator Lugar wrote a great piece on these efforts. Jack Dorsey, James Eberhard, and I told her first hand about our experience on our recent tech delegation trips to Iraq and Mexico, which she was very excited about. We also spoke about the success and momentum of the Alliance of Youth Movements, a nonprofit organization I helped start which is looking to advance grassroots movements seeking positive social change using the tools of 21st-century technology. As a result of the dinner, Secretary Clinton declared in an e-mail to her staff: "We are using all tools at our disposal to practice 21st-Century Statecraft...harnessing the power of technology." I was impressed with Secretary Clinton's engagement in the discussion and her genuine excitement to not only learn, but also make sure we act. From organizing a technology delegation to Iraq last April to sending Google CEO Eric Schmidt to Baghdad last month and hosting this dinner discussion, it's clear that the U.S. State Department is strongly supporting and encouraging digital diplomacy. By working with government and private-sector leaders, we're all banding together to figure out the most effective means to leverage digital technology tools to promote diplomacy around the world.